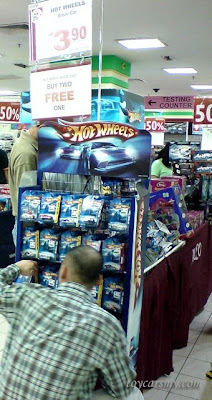 Hot Wheels basic 2008 assortments for RM3.90 buy 2 free 1 in Jusco Day Mid Valley. There are many good models in the assortments, you will able to pick some from those you passed last time. The catch for the promotion is the free cars, you have to select from the counter with very very very lousy assortments, I bet you hardly pick one. PS: The one in the picture is our HWCM member? ?